2015 marks the 10th anniversary of the Washington Nationals Inaugural season. Topps marked the move of the Expos to DC and becoming the Nationals with a 10 Card insert set that was part of 2005T Update. 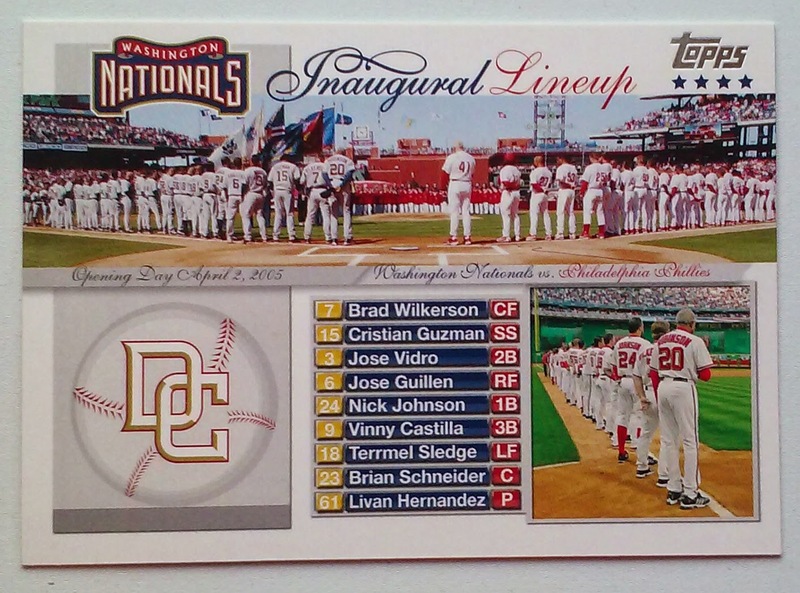 There was a card produced for each player in the Nats opening day lineup plus the above team card. The batting order for that game is presented on the bottom center of the card. Can anyone tell why I love this card? Check the main image on the card, now look at the cover image for the Phungo Blog above. Yes both pictures were taken at roughly the same time at different angles. Notice the distance between Charlie Manuel and Jimmy Rollins in both pix. The Nationals started their history versus the Phillies on the Road, This is not uncommon, it gives the club extra time to work out the kinks of their new Headquarters before having a Home Opener. Team Phungo was enjoying the Phillies Home Opener on that day 10 years ago and as a bonus we got to see the First ever game of the Washington Nationals. Of course the card is far from perfect. Another Quibble with the card is that it is dated April 2nd. The game took place April 4th 2005, which can be seen in the box score. 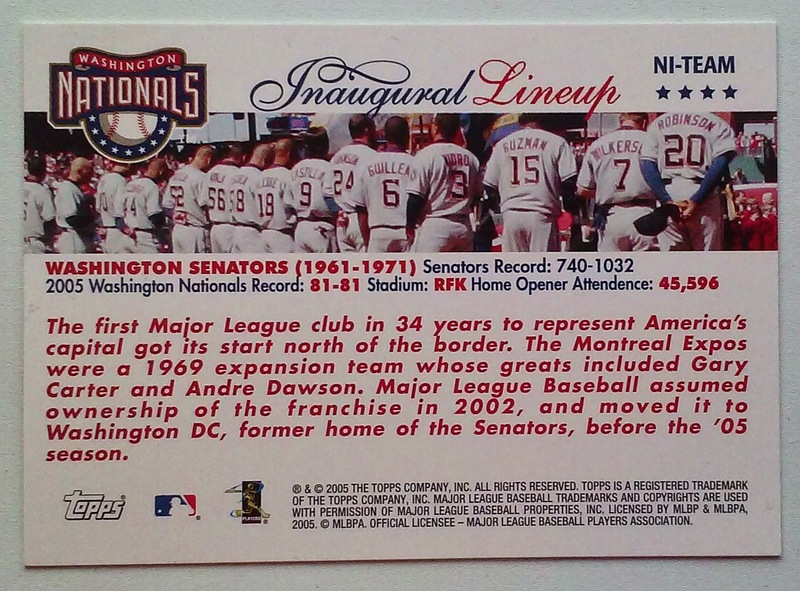 The B-Side of the card contains a close up of the Nats lineup for that first game and a brief description of the comings and goings of DC teams. As part of their 10th anniversary the Nationals have a series of events planned. One of their promotions is a bobblehead of their first ever starting pitcher Livan Hernandez. The giveaway is scheduled for May 4th versus the Marlins - No Phillies tie-in. I do find it amusing that the Nationals have a bobblehead promotion related to a game that was hosted by the Phillies. The Nationals Team Card is going to go into one of my favorite Binders, the Phungo Games Collection of cards related to games that we were fortunate enough to attend. Above we have the ticket to that game another nice piece of memorabilia buried in the Phungo Museum. For a brief posting regarding this card and the great Frank Robinson click here. For the SABR Games Project description of this game click here. 2019 0809 added Frank Robinson related content, added link to SABR Games Project.